Here’s an offer that’s only natural. 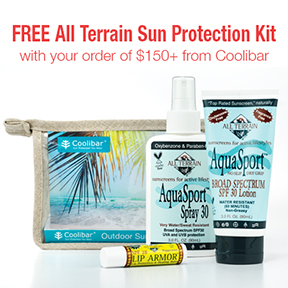 Purchase $150 or more from Coolibar, and get a FREE All Terrain Family Sun Protection Kit! Just enter KIT14 at checkout. The Skin Cancer Foundation recommends that you use a broad spectrum SPF 15+ sunscreen every day. For extended outdoor activity, you should use a water-resistant, broad spectrum sunscreen of at least SPF 30. All Terrain makes UVA/UVB sunscreens that are extremely moisture resistant and great for sensitive skin with no eye sting. They are transparent (no white noses!) and water resistant to 80 minutes. 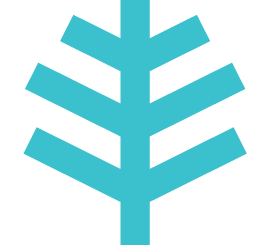 They are also PABA-, oxybenzone- and paraben-free, a terrific alternative to chemical-based products. It’s total coverage and unbeatable sun protection from All Terrain and Coolibar sun protective clothing! SHOP NOW! NOTE: If you purchase $150 or more from Coolibar online, do NOT add the sun protection kit to your shopping bag. Simply enter KIT14 at checkout and it will be added for you as a FREE item! Limit one kit per $150+ 0rder. All Terrain Family Sun Protection Kit is also available for individual purchase at a $35 retail value. Help Us Tell Hugh Jackman About Sun Protective Clothing! 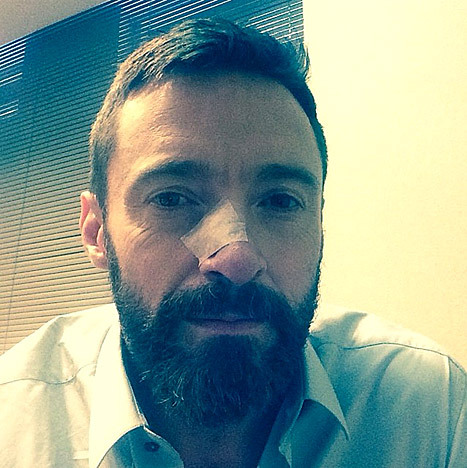 At this point we are sure that you’ve seen the news about Hugh Jackman’s second skin cancer scare. On Instagram May 8, Hugh pleaded with his fans: PLEASE! PLEASE! WEAR SUNSCREEN! Easy to wear. You don’t have to reapply every two hours! Suitable for water sports. We have several fabrics that are quick-drying and provide four-way stretch for activity in and out of the water. Cool and comfortable. Lightweight, moisture-wicking material keeps you cool even in the hot sun. Great-looking! Need we say more? All sunscreens are not created equal. To help consumers better understand what they are buying, and to help protect them from unwanted excessive UV ray exposure, the U.S. Food and Drug Administration (FDA) announced new sunscreen labeling requirements. First announced June 14, 2011, it was in 2013 that consumers began seeing sunscreen labels with the changes required for compliance with new FDA regulations. We’ve compiled a list of those changes and what to look for on labels. Not every sunscreen is Broad Spectrum, so make sure you check the label. Only Broad Spectrum sunscreens can do both, prevent skin cancer, photo-aging and sunburn. These claims cannot be proven. Instead, labels will state water resistant if it applies. To make this claim, the product must pass another test. This test shows how long a sunscreen keeps its SPF when a person goes in the water or sweats. The label also must state how long the water resistance lasts, either 40 or 80 minutes. There is not sufficient data to show that products with SPF values higher than 50 provide greater protection for users than products with SPF values of 50. Remember, the regulations are to help consumers know which products offer the best protection. To learn more about the current FDA sunscreen regulations visit the FDA website. What do you look for in a good sunscreen? 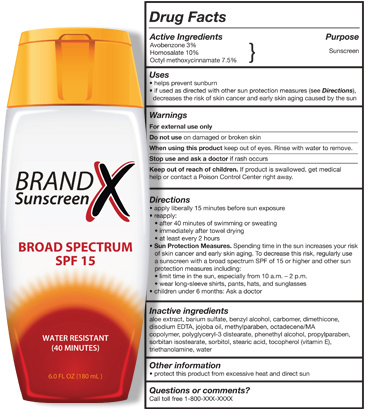 Do you find the new sunscreen label changes helpful? Apply broad-spectrum SPF 30 sunscreen every 2 hours. Excitement is building as the Western & Southern Tennis Open in Mason, OH wraps up this weekend, making way for the US Open! This tournament is the perfect venue to call attention to the number of hours both fans and players will be spending under the sun in the next few weeks. Coolibar has teamed up with the Andy Caress Melanoma Foundation Sunscreen Squad and outfitted volunteers with UPF 50+ clothing to distribute sunscreen samples to remind attendees they need sun protection. 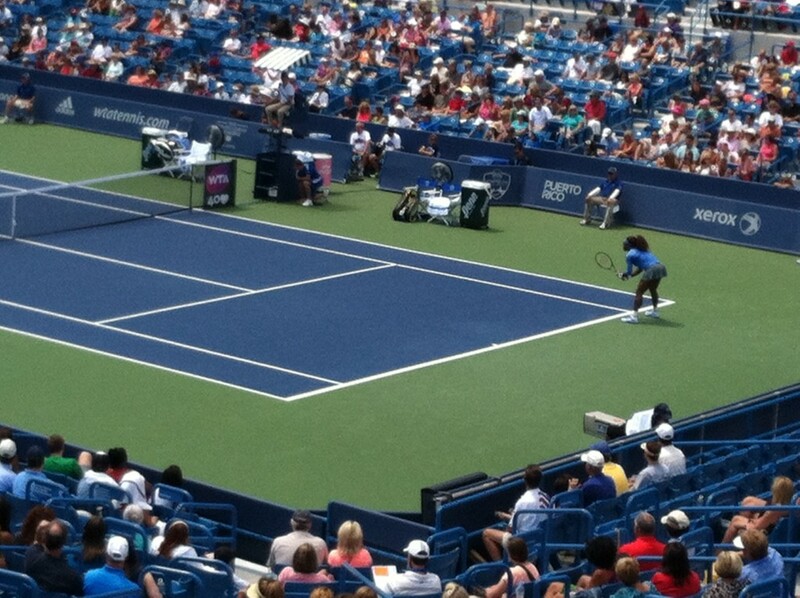 The hours spent on the tennis court, under the sun, add up. 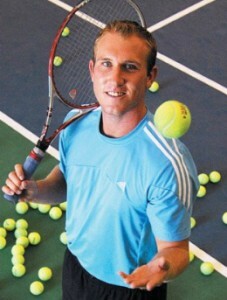 Some of the best players on the court have dedicated themselves to promoting skin cancer awareness and sun protection, including tennis pro Andy Caress. Andy, also founder of the Andy Caress Melanoma Foundation (formerly Mela-KNOW-More), had one wish before his untimely passing from skin cancer at age 24, to tell people the message of his life – “People should know more about melanoma.” Andy’s family and volunteers continue to spread the message of early detection and sun protection, especially at events Andy was passionate about. 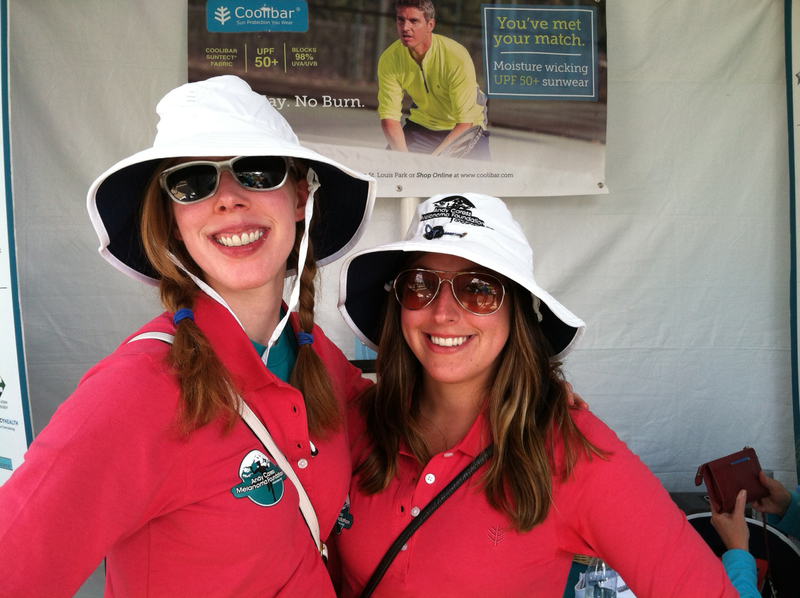 Last year, ACMF Sunscreen Squad volunteers passed out 45,000 sunscreen packets and distributed 10 gallons of sunscreen to spectators, athletes, ball kids and volunteers throughout the grounds at the 2012 Western & Southern Tennis Open. They, along with Coolibar, hope to knock last year’s record out of the court! 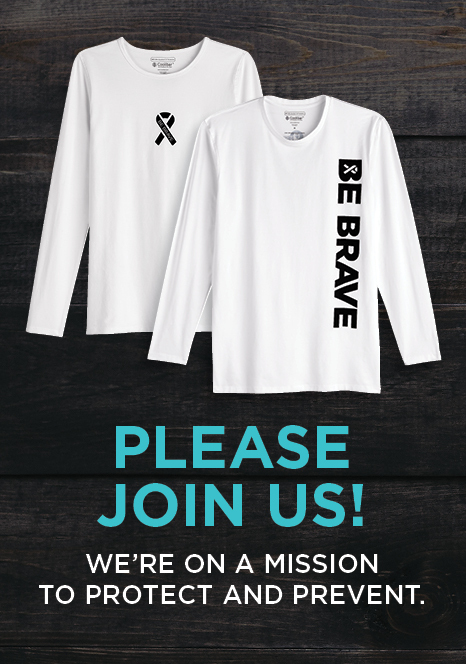 The Andy Caress Melanoma Foundation is dedicated to the prevention of melanoma, the most deadly form of skin cancer, through awareness, education and support of research to find a cure. The Sunscreen Squad is a program designed to distribute sunscreen at public events and tennis and swim clubs around the country. Gallon sunscreen dispensers will be installed in as many locations as possible. Donations fund this effort directly. Young ladies playing it sun safe the the Andy Caress booth by applying sunscreen! MINNEAPOLIS, July 1, 2013 – Coolibar, the nation’s leading sun protective clothing manufacturer, conducted a survey to reveal the top 10 dermatologist recommended sunscreen brands. The survey was conducted at the 2013 Annual Meeting of the American Academy of Dermatology (AAD) from March 1-5, 2013 in Miami Beach, FL. Neutrogena and Aveeno top the list as perennial favorites followed by La Roche-Posay, Elta and Vanicream in the top five. We had a record number of 1,572 dermatologists weighing in on the most reliable sunscreens recommended to patients as part of their sun safety education. About Coolibar: Coolibar is the most recommended and tested sun protective clothing company in the United States. Based in Minneapolis, the company was founded in 2001 to bring Australia’s world-leading approaches to sun protection to the American market and beyond by producing and selling sun protective apparel for active families through catalog and online. Dedicated to the highest quality sun protective clothing, hats and accessories, Coolibar guarantees UPF 50+ ratings for the life of their garments. Each garment is developed with sun protection as the number one priority with a full line of proprietary SUNTECT® fabrics. Coolibar has been recognized by the Skin Cancer Foundation, the American Academy of Dermatology and the Melanoma International Foundation for effective sun protection. Coolibar Cares, the company’s giving back initiative, supports programs such as SunAWARE, School Sun Hat program, Doctor Connect, the AAD Camp Discovery for sun sensitive children as well as athlete sponsorships and product donations. For information about Coolibar, go to www.coolibar.com or call 1-800-926-6509. Anticipation is growing as everyone awaits a weekend filled with water play, lip-smacking barbeques and grand firework displays this Independence Day. While the 4th of July can be fun, it can also be a hazardous day, especially for children who do not understand the dangers associated with some of the traditional festivities. This 4th of July, keep these simple safety precautions in mind when you and your kids are out at play. Any body of water can be dangerous for children who are not under close adult supervision. The American Red Cross offers this safety advice when in or around water. * Actively supervise children whenever around the water—even if lifeguards are present. Do not just drop your kids off at the public pool or leave them at the beach—designate a responsible adult to supervise. Teach children to always ask permission to go near water. * Always stay within arm’s reach of young children and avoid distractions when supervising children around water. * Have young children or inexperienced swimmers wear U.S. Coast Guard-approved life jackets around water, but do not rely on life jackets alone. This includes when boating too. * Even if you do not plan on swimming, be cautious around natural bodies of water including ocean shoreline, rivers and lakes. Cold temperatures, currents and underwater hazards can make a fall into these bodies of water dangerous. See all of the American Red Cross water safety tips. Each year approximately 8,800 people visit the emergency room due to firework-related injuries. 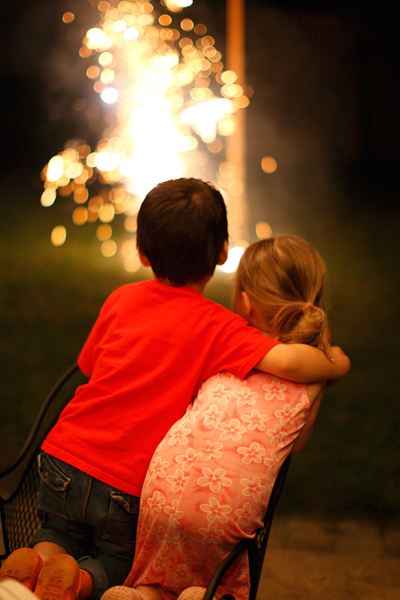 The risk of fireworks injury is highest for kids ages 10 to 14 – more than twice the risk for the general population. The U.S. Consumer Product Safety Commission asks that you please use the following safety measures if fireworks are legal in your area and you plan on creating your own celebratory display. * Never allow young children to play with or ignite fireworks. * Always have an adult supervise fireworks activities. Young children often suffer injuries from sparklers, which burn at temperatures of up to 2,000 degrees—hot enough to melt some metals. * Never place any part of your body directly over a firework when lighting the fuse. Back up a safe distance immediately after igniting. * Never re-light or pick-up fireworks that have not ignited fully. If possible reach them with a hose and dowse with water before approaching. * Keep a bucket of water or hose handy in case of fire and to dowse fireworks after use. See all of the U.S. Consumer Product Safety Commission firework safety tips. Summer camp is jam-packed with activities from sunrise to sunset. 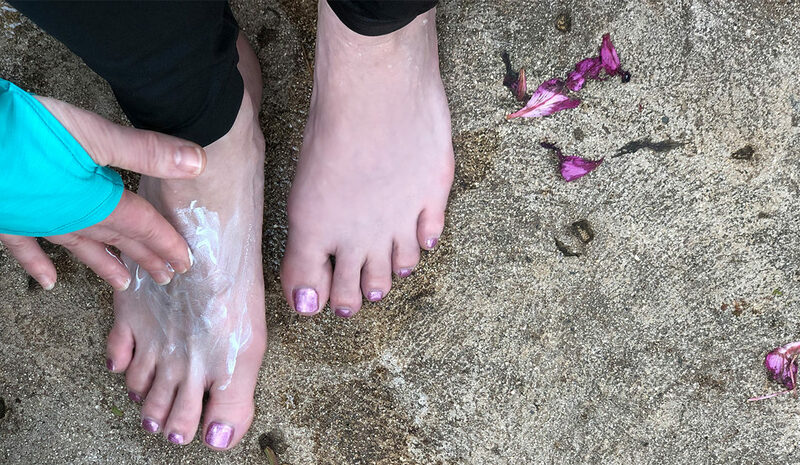 Counselors and camp staff make it a priority to ensure safety of all campers; however, with the rigorous reapplication routine sunscreen requires, sometimes sun protection may be overlooked in all the commotion. Sunburn and skin damage are easily preventable. Educating and equipping children with good sun protection habits prior to the start of camp is essential. While sunscreen is a necessity, adding additional forms of sun protection may ease parental anxiety. 1. Pack sun protective swimwear and clothing: The Skin Cancer Foundation recommends using sun protective clothing first, followed by sunscreen. A WHITE COTTON T-SHIRT WILL NOT PROTECT YOUR CHILD FROM THE SUN! In fact, it only offers an ultraviolet protection factor (UPF) of 7, and even less when wet. UPF and SPF ratings for sunscreens are similar, but UPF is the standard for clothing and accounts for both UVB and UVA rays. When shopping for UPF clothing, look for a UPF 50+ rating, the highest rating available. This means a garment will block 98% or more of UVA and UVB rays. Swim shirts (also known as rash guards), are great for extended water play since the sun protection will not wash out. 2. Remember a wide brim hat: To be protective, a hat must have a 3” brim or greater (for toddlers this might be less) or a flap in the back to cover the ears and neck if it’s a baseball style cap. Hats also protects the scalp, especially along the part-line. 3. Wrap on UV sunglasses: Eyes are susceptible to sunburn too, and not all sunglasses protect against UV. Opt for a pair of wrap style sunglasses that fit closer to the face so UV rays don’t leak in the sides. Look for sunglasses labeled UV 400 or blocks 99% or greater of UVA and UVB rays. For younger kids, purchase sunglasses with straps to keep them secure. Look at the label. Many parents assume the higher the SPF the better, which is not necessarily the case. Look for quality ingredients such as zinc oxide and titanium dioxide. These are physical sunscreen ingredients. Choose an SPF of 30 that’s labeled broad spectrum, which protects against both UVA and UVB rays. Avoid aerosol sunscreens. The major drawback of a continuous spray sunscreen is that it could get into the eyes or inhaled by a child, long-term data on those effects are unknown. Apply generous amounts on exposed skin. Start with the neck down, covering thick and evenly on all areas of the body, not forgetting the ears, backs of the hands, crease of the neck, underarms, between the fingers, underneath the bathing suit (if it’s not sun protective). After covering those major areas, do the face last. Even on a cloudy day, 80 percent of UV reaches the Earth’s surface. Reapply. According to new Food and Drug Administration guidelines for sunscreens, labels must display a reapplication time of either 40 or 80 minutes and after swimming or sweating. Remember to do so. 5. Inquire about camp sunscreen application policies: Most camps are like schools, sunscreen is not allowed without written consent. Also, camp staff are often discouraged from helping kids apply sunscreen. Teach children to do their best applying sunscreen everywhere they can reach and ask for help on spots like their back. 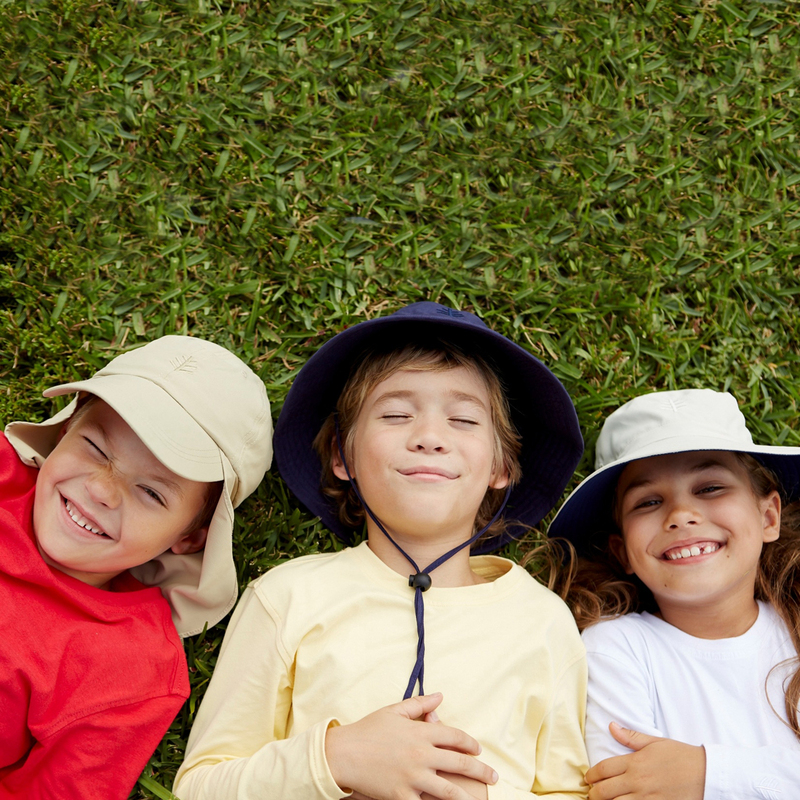 More about the Pediatric Sun Protection Foundation and sun protection advice for parents. Read what the American Camping Association has to say about fun in the sun. 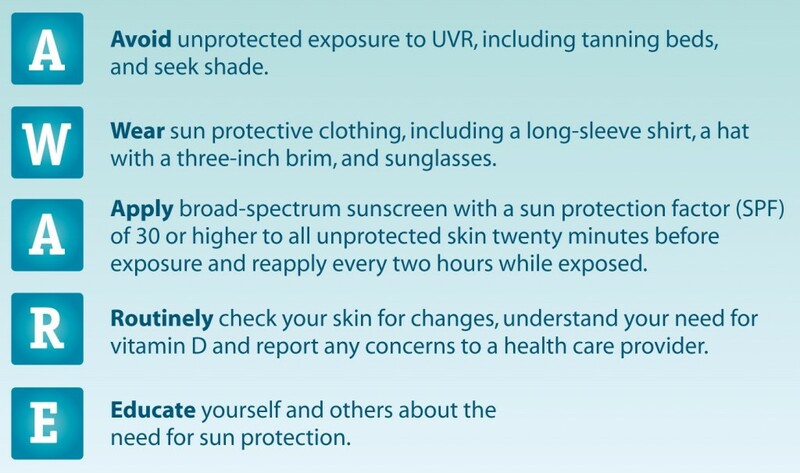 Follow SunAWARE for easy to remember steps for sun protection. Shop Boys and Girls UPF 50+ clothing. Fifteen minutes of sun exposure does more than sunburn fair skin, it ages skin too. 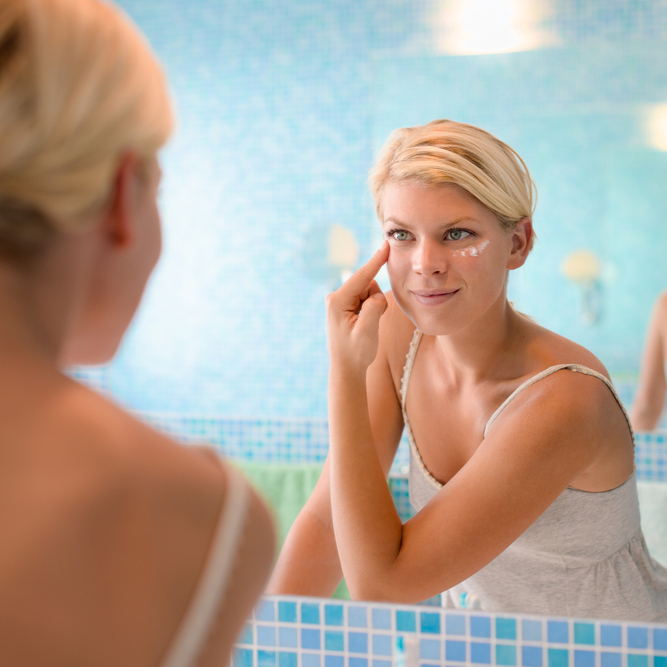 The good news is with daily use of broad-spectrum sunscreen, people can prevent photo-aging. Even though dermatologists currently recommend daily sunscreen use to patients for wrinkle, age spot and skin cancer prevention, a new Australia based study in “Annals of Internal Medicine” provides the most extensive evidence of sunscreen’s anti-aging effectiveness to-date. 900 Caucasian participants in Australia under age 55 were randomly split into two groups. Group one was instructed to apply sunscreen to their head, neck, arms and hands every morning, after a few hours of outdoor sun exposure or after being in water or sweating. Group two was told to use sunscreen at their leisure. Two-thirds of all participants had small skin samples taken from the back of their hands at the beginning of the study. Four-and-a-half years later, researchers once again excised a skin sample from the same participants, but the results of the study turned out to be more visible than expected. Those who applied sunscreen daily displayed younger looking skin than those who used sunscreen at their discretion. Aussies are already known for their diligent sun protection habits but not necessarily motivated by anti-aging efforts. Australia has the highest incidence of skin cancer of any country in the world. Almost two out of three Australians will be treated for some form of skin cancer during their lifetime and melanoma is more commonly diagnosed than lung cancer. Factors contributing to Australia’s skin cancer rates include the generally light skinned population, the active outdoor lifestyle, depleted ozone layer and the country’s proximity to the equator. According to the “NY Times”, most participants, regardless of which group they were assigned, were using sunscreen at least some of the time, and two-thirds wore sun hats. It’s never too late to start using sunscreen. Dr. Nancy Snyderman, NBC’s chief medical editor reported on the “Today Show”, “Even if you’re 55 you can still roll back the clock two or three years”. Choosing the right sunscreen is essential for the protection to be effective. 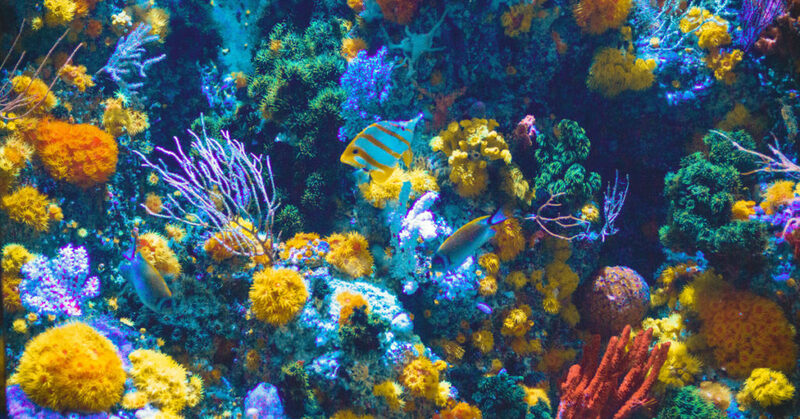 In the study, participants used broad-spectrum sunscreen, which blocks both ultraviolet-A and ultraviolet-B rays, and sun protection factor (SPF) of 15. Reapplication throughout the day was also essential. 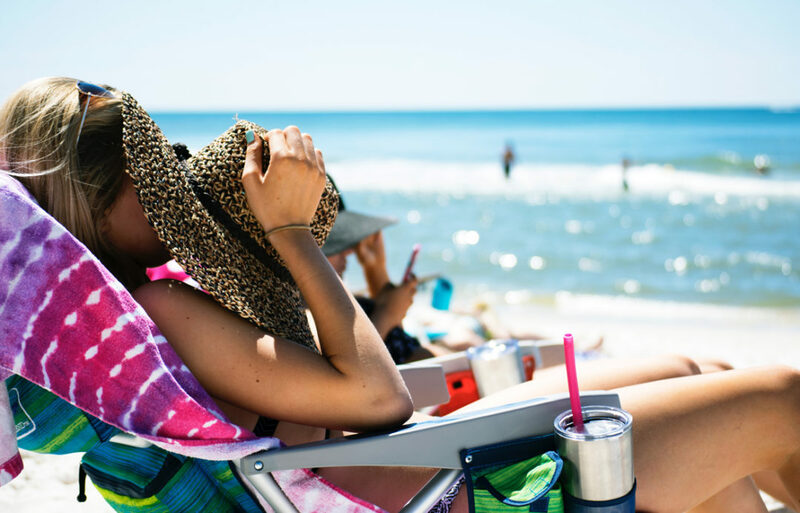 For complete sun protection, dermatologists recommend wearing sun protective clothing, a wide-brim hat, UV 400 sunglasses, and applying a broad-spectrum sunscreen with SPF 15 or greater.